Three Australian lieutenants are court martialed for executing prisoners as a way of deflecting attention from war crimes committed by their superior officers. NYTimes: Most of the Australian films that have been released in America take place at the turn of the century. 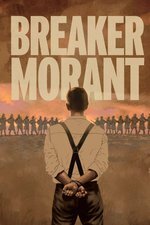 Breaker Morant, like many of these, accounts for this turbulent period in Australia's history by exaggerating the gentility that the characters and their countrymen have tried to adopt, in reaction to British rule. In this case, the result is a touchingly stiff-upper-lip approach to the events that occur in the courtroom. The events are so unfortunate and unjust that the film's air of restraint gives it a genuinely tragic dimension. The Guardian: The rousing finale to Breaker Morant is a great case study in why storytelling liberties are often placed ahead of fidelity to fact: if Beresford had remained true to the real story, we would never have experienced one of the greatest scenes in Australian cinema. And, arguably, we wouldn’t have experienced a finale reflective of the characters’ tumultuous emotional state. "Shoot straight, ya bastards" remains a fantastic line. For pity's sake don't shoot 'em." This was the first DVD I ever owned. I still have it and watch it regularly. "That broke the monotony, didn't it?" is one of the coolest lines ever uttered.